Shelley cartoons: NEW! Cookie smell with every comment!!! NEW! Cookie smell with every comment!!! Below is my old comment form. We here at Shelleycartoons strive to make your visit to this blog as comfortable as possible. So the technical problems will soon be resolved by our team of IT professionals. Following this, the warming love-electrons will no longer smell of aniseed. They will smell like cookies. Choc-chip cookies. Roast lamb and vegetables? Really? Oh dear. Something must have happened. No waaiiit. IT have just told me its the STIB (superior taste in blogs) receptor. It is a dynode, linked to the back of the warming love-electrons. 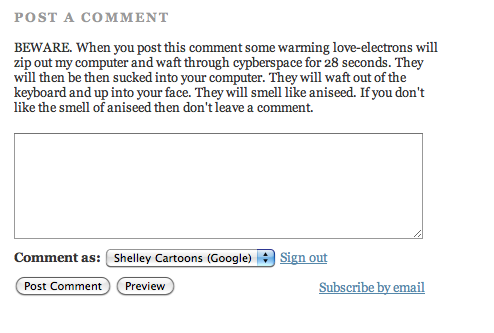 It registers when a comment-maker has exceptional taste in blogs. So it's perfectly safe, and to be expected really. AND Personally for me its "jam drops"